Report by Rowan Worsman, Conservation volunteer. 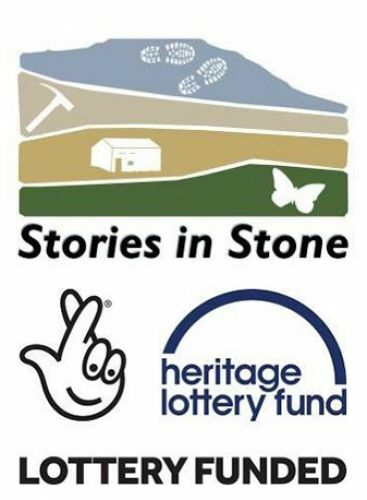 This project is part of Stories in Stone, a scheme of conservation and community projects concentrated on the Ingleborough area. The scheme was developed by the Ingleborough Dales Landscape Partnership, led by Yorkshire Dales Millennium Trust, and supported by the Heritage Lottery Fund. The 3rd of July dawned grey and misty and wet. The clouds were still swirling round Ingleborough when I arrived at the Hill Inn lay by at 09.30. There was white and brown water issuing from Skirwith cave and the other springs from the fell. Obviously there had been a great downpour. As I sat with my brew in the car watching the grey mist ascend up Chapel-le-Dale, I looked on the divers’ website to see John Cordingley’s morning rain report - 9 mm of rain as opposed to 2.5 mm in Lancaster. The herd of cows in the field opposite didn't seem too bothered. Anyway, I was there to meet the rest of the cave conservation gang organised by Kay Easton to put a tube in the Great Douk dig before it collapsed. The Great Douk dig is one of the oldest digs in the Dales, as it commenced in 1969. One by one the team assembled, and consisted of Fred Rattray, Dave Allenach, Andy Farrow, Edward Easton and myself. Andrew Hinde and Ged Benn had already been to Colt Park to load up the vans with all the equipment we would need. We were able to get the vans very close to the site, but needed extra care due to the wet conditions of the ground. The vans were heavy laden with tools and cement bags. All the equipment needed had then to be ferried down to the site. There was a pair of Grey Wagtails we upset but they soon settled down. Due to the rainfall, there was a substantial amount of water coming out of Great Douk. I went into the cave on Saturday and was quite glad we didn't have this amount of water. Of course, some of the water was going down the dig, so we were all kept busy building dams to divert the water away. Ged then clad his caving gear and went down the hole. The shaft was accessible by two fixed ladders which we later removed. Dave was involved in the original dig in 1969, so he had quite a few stories to tell. Somewhere down in the dig depths are two telegraph poles. One interesting story involved the Hill Inn where the digging team met one evening. They all bought a drink and then some of them disappeared up to the dig to carry out an explosive procedure. The noise echoed around the valley. The lads then headed back to their drinks in the Hill Inn. Back to the present the weather upstairs had improved to blue sky and white fluffy clouds as we carried on. The job to be carried out entailed fixing scaffolding poles in the shaft to enable a platform to be made which would house the tube. The tube would then stabilise the shaft. The new scaffold support was measured and then had to be translated onto a sheet of fiberglass. The cut-out fiberglass was then placed on the poles. Cement was then mixed to fill in the gap between the rock wall and the fiberglass. A small section of the tube was placed onto the fiberglass after having lino floor covering wrapped round it. There was a small amount of rain water still running into the shaft, so a plastic drain pipe was cut in half length ways to act as an aqueduct. During all this activity two of us carried out another job. Andrew had somehow stored some plastic drain pipes in the little cave up to the right of Great Douk. These needed to be transported out of the cave and up to the sheep fold so that Rodney, the farmer, could use them for sheep feed containers. The surround of Great Douk shakehole is surrounded by trees and some very thick mosses. Quite lush vegetation. Back down the shaft the cement needed to set. All the equipment then needed to be transported back up to the vans and loaded to return to Colt Park. Ged had done a sterling job down the shaft. Grand views met us at the top of the shakehole looking out over Ingleborough and Whernside. Everyone was weary by this point as it had gone 16.30. We headed back to Colt Park, unloaded the vans and welcomed a brew. Due to the weather forecast it was decided we would meet again on Thursday, as Tuesday was going to be wet. On the 6th of July we met at Colt Park, the base for the Natural England of Ingleborough. We were joined by Terry Devaney and Tim Sullivan, and later by Andrew Hinde and his dog Tess. We had a brew and emerged into the last of the greyness and drizzle for the day. The weather very soon warmed up bringing the vampire midges out in force. The van was loaded up with all the equipment we would need and we headed off to Great Douk. Of course, everything then needed to be unloaded and taken down to the dig site. We had not had the rain which was forecast, so there was no damage. Work soon got underway to remove the fiberglass sheet and the temporary tube. The difficult bit was transporting the new big pipe down to the site. This was achieved by using ropes and making use of the mossy sides of the shakehole. The pipe was then inserted into the shaft and it took a little bit of persuasion to allow it to sit right. Then the concrete had to be mixed and put round the pipe to hold it in place. Stones were mixed in with the concrete. The scaffolding poles were then sewn off so the whole thing was flush. Stones were used to back fill between the wall of the shaft and the pipe to the top of the shaft. A lid was then made and placed over before we piled stones on top to hide the shaft entrance. Everything then needed to be taken back up to the vehicle to return to Colt Park. The shakehole was now left in peace and quiet with just the sound of the water. Back at Colt Park everything was unloaded and put away. Then it was time for cups of tea, glasses of ginger beer and ice creams, what more could we want? Everyone then went on their way after another hard day’s work, lots of stories and the company of great people.